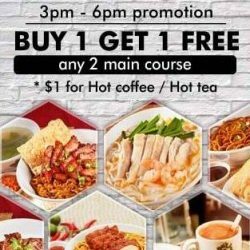 Enjoy Shan Cheng Ipoh Horfun's Buy 1 get 1 FREE promotion* with order of any 2 main course on weekdays from 3pm to 6pm! Promo ends on 31 May 2017. Find them at The Central, Bukit Panjang Plaza, Paya Lebar Square and Compass One!